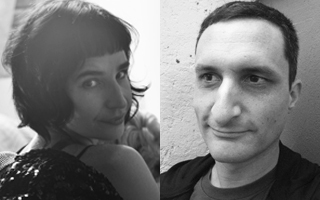 SL GREY IS A COLLABORATION OF TWO WRITERS FROM SOUTH AFRICA: Sarah Lotz from Capetown and Louis Greenberg from Johannesburg. Their first novel, The Mall, was published by Corvus in 2011. 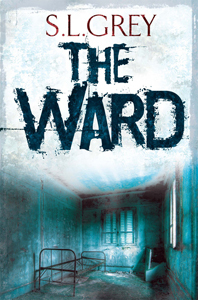 Their new novel The Ward will be published 1 October 2012. Their next novel, The New Girl, is due for publication in 2013. For Still they wrote ‘Still’, a story with a reflective, downbeat and haunting mood. SL: That’s what S.L. Grey is all about. We’re a collaboration between Capetown-based Sarah Lotz and Louis Greenberg from Johannesburg. It was Louis’ first experience at collaboration, but as a screenwriter and also half of YA zombie novelist Lily Herne, Sarah is very used to collaboration. We work well together and we are able to pool our complementary skills. Also, the combined energy keeps the momentum going even through rough patches. What’s it like being a writer in South Africa? SL: South Africa has a huge community of talented writers and a small pool of very dedicated and discerning readers. Publishing in South Africa alone can only ever be a very rewarding hobby, and breaking into the international market is a difficult prospect. Sometimes it seems that South African stories put us in a desirable niche, and other times South African settings seem an obstacle to international readership. It’s hard to gauge and difficult to plan for; all we can really do is write the sort of books we like to read, wherever they might be set. 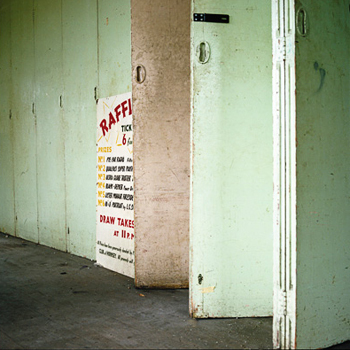 You picked a photograph taken in the Green Room at Hornsey Town Hall, showing a 1960s poster for a local raffle. Why this particular photograph? SL: It struck us as very sad. The sign with ‘Raffle’ on it speaks of departed joy. You can hear the echoes of happy voices now gone. What did you want to express with ‘Still’? SL: We wanted to put that terribly sad mood into our story, because that’s the feeling most of the photos evoked. Our novels and short fiction to date have been quite satirical with a lot of laughs mixed in with the chills, so such a sombre mood was something new for us. It’s Roelof’s fault for taking these photos. Over the next couple of years we’ll be trying all sorts of moods and subjects. Our short stories in an upcoming Pandemonium anthology will be something different again, and our thrid novel, The New Girl, due for release in 2013 has a different tone from The Mall and The Ward. How do you come up ideas? SL: Mostly we start off with a base of everyday suburban life and twist it around. So, the things we see every day are the visual background and the warped pictures in our minds serve as the over-layer. Our writing is very visual. How did you become writers? L: My father was a journalist and editor and my mother an English and Latin teacher. I grew up with books around me – very few children’s books, but I’d just breathe in the atmosphere of the covers and the ink. S: I’ve been writing stories for fun since I was small as a way to escape, so I can’t actually recall exactly what or who influenced me to do this (although I suspect it was reading too much Stephen King and PKD at an early age). I’m still gobsmacked that I’m fortunate enough to do what I love for a living. SL: Right now, Louis is working on Dark Windows, a solo literary thriller set in an alternative-present Johannesburg. Sarah is working on The Army of the Left, the third book in Lily Herne’s Deadlands series.